For sleeving I use the softer, more flexible, less microphonic and durable black sleeving for the main run on headphone cables. Some builders use standard microphonic Techflex for the entire run… I don't. My opinion (brief description) of each Black Series cable… your ears could hear them differently. BlackTop Same design internally as BlackGold, but no silver this time (all copper). Like a BlackCopper on steroids, twice the strength or more. Best for headphones, especially Grado and AKG. BlackCrystal Same design internally as BlackGold, but no copper this time (all silver). For those that want a sturdier all silver cable with the similar benefits of BlackSilver. Best for Senn, or other headphones you want to keep neutral with added strength over BlackSilver. BlackMax As with BlackGold, a mixture of copper and silver. Just not as tasty sounding IMO, but the most popular choice for Beyer headphones and peeps seem to dig them. Best for headphones. BlackCopper All copper design for taming some headphones / systems. Nice for replacing a stranded copper cable (most stock and builders) to increase clarity but retain warmth. Good for Grado on a budget. BlackSilver Revealing, tighten lows, neutral and never harsh to me compared to other "silver" cables (some builders use silver coated copper or stranded silver). However it's the least durable (if abused) of any Black Series cables. Then again if you follow my proper care of cables guide, should provide many years of enjoyment. If you invest in a quality cable, treat it as such for long life. Headphile cables should not be bundled, wrapped in a figure eight, wrapped around headphones, twisted over or kinked at right angles. Storage of cable should only be circular, no less than 3-4" circumference (or let it hang). When the cable is shipped to you, it will be in this natural position and should continue to be stored or transported in this way. You can kink a cable permanently the first moment you use it if you don't use my suggestions. Replacement Policy… If you are the original purchaser of a headphile cable (I will look it up), you are possibly eligible for a one-time discount to have your cable replaced for up to half current price (plus shipping), or half credit of original price if stand alone cable. Old cable must be returned in it's stock condition (not have been tampered with, modified, or attempted fix) before a build will start. Configuration change is allowed (length, Series, termination), but credit towards that is half of original cable price only... and only up to half the cost of new cable chosen, if it costs less than original. The ultimate interconnect is none at all, Headphile XRS uses this consideration in our silver reference design. Originally designed for testing different RCA connectors against a reference of not having one at all, this cable comes straight from our testing bench and was not originally intended to be sold. 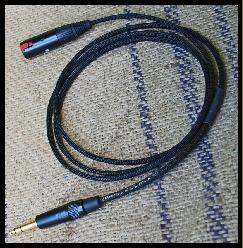 More and more audiophiles seem to be understanding that those beautiful (and expensive) RCA terminators can actually be a hindrance to a line level signal. Thus in order to hear the truest signal and not the plating scheme or the massive chunk of metal in the build of many RCA connectors, we're releasing these to the public and the purists. The solid fine silver wire used in this design actually connects directly to your female RCA's by pressure from the sleeve only, no solder, no RCA terminations. Hand molded by us, XRS let's a portion of the wire, make direct contact to your amp/source without the need for a RCA termination, similar to the way the positive makes contact inside your amp/source. Silver wires are looped and sealed, no loose ends. Cables join at center or end only, to allow twist of connector.